High power and reliable constant current are the primary requirements. For small scale work, transmitters capable of sourcing up to several hundred milliwatts of power might be adequate. For larger scale work, it is possible to obtain transmitters that can source up to 30,000 watts. Current is usually injected as a 50% duty cycle reversing square wave; that is, current is on for several seconds, off for several seconds, on with reversed polarity, off, etc. Fig. 184 Sorting wire and equipment to begin a resistivity / IP survey for a mineral exploration target. The survey lines will be up to 2 kilometers long. 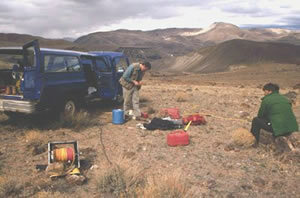 Transmitter wire is on a back portable reel, and wiring for reading potentials is bundled around cans for generator fuel and water for the crew of 4 field operators. Decay voltages in IP surveys (measured during a time domain transmitter’s “off” stages) are often two orders of magnitude smaller than primary voltages. Therefore, very high-power transmitters are often desirable. For mineral exploration in conductive ground (where potentials will be small), it is possible to obtain transmitters capable of sourcing tens of kilowatts of power. Needless to say, these are rather dangerous systems, and definitely not portable! The figures below show several currently available transmitters. Fig. 186 Three transmitters and their power generators.Images are from Zong Engineering and Research sales literature. Fig. 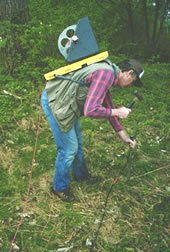 187 0 kW Scintrex resistivity-IP transmitter in use in the field. The power generator is on the pickup truck. For DC resistivity sounding, a simple digital volt meter can be adequate. A more complex system may involve amplifiers, filters, transmitter synchronizing circuits, display, storage, many inputs for simultaneous recording of many potentials, and other features. Synchronization with the transmitter is essential if IP data are to be gathered, but it is not critical if resistivity information only is to be obtained. IP receivers also must be capable of recording several signal strengths covering several orders of magnitude because signals while the transmitter is on may be several volts, while decay voltages during the transmitter’s “off” time may be only a few micro or millivolts. In general, current injection and potential measurement electrodes are not interchangeable. However, automated acquisition systems using smaller source currents do employ the same stainless steel electrodes, both for sourcing current and measuring potentials. This becomes more and more difficult as source currents increase because the ground can become altered by high current densities. For injecting current, low impedance is required, i.e. good contact resistance is the primary concern. Stainless steel stakes, sheets of foil, wetted (and perhaps salted) ground, are all possible approaches to improving contact resistance. 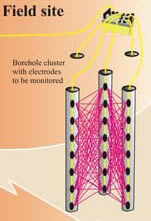 For measuring potentials, low noise, non-polarizing (not necessarily low impedance) electrodes are the primary concern. Small lead plates buried in the soil will often do the trick. In more difficult situations, wet electrodes made from porous ceramic jars containing copper sulfate solution are required. See Corwin, 1990 for a good discussion of electrodes for this type of galvanic work. Fig. 188 Ordinary insulated wire on reels (possibly on a back-pack) for easy handling are most common (figure to the right). For small scale work, some systems are available that use multiconductor cable, and possibly “smart” electrodes that can be switched between input and measurement functions by computer. For large scale work, this is not practical because of the large currents involved (up to a hundred Amps or so in some cases). Multiconductor cables with individual wires capable of carrying that current would be prohibitively heavy for mineral exploration surveys, which commonly involve profile lines several kilometers long. However, there are some systems that use multiconductor seismic cable for the potentials while requiring the normal single, heavy gauge wire for the current source. Since the early 1990’s manufacturers of instruments have been producing automated systems which permit the use of electrodes for either current source or potential measurements. Some systems involve planting a series of electrodes and wiring them together with a cable, which allows each electrode to be selected either as a potential electrode or as a current source. This procedure is being implemented in borehole projects, as well as surface surveys. Examples of systems that work in this manner are given in the following list (as of January 2007). Another arrangement involves a towed array system in which all potential and source electrodes are basically heavy metallic weights. This arrangement is efficient when the survey site is essentially flat and ground is relatively soft. Other similar systems used both for land and marine use use capacitively coupled electrodes rather than electrodes that make galvanic (direct) contact with earth materials. One example of this approach can be seen at at the Geometrics (image to the right) website (as of January 2007), and others. 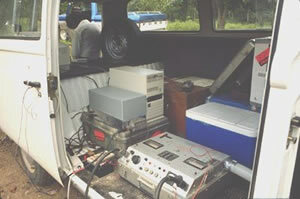 In the early 1990’s receivers were developed that could record complete digitized potential waveforms rather than simply measuring voltages at specific times relative to the transmitted signal. These systems produce large data sets, but with field computers running the systems, storage is not a problem. Fully digitized waveforms have several potential advantages, including identification and removal of all types of noise, and interpretation of subtle, 2nd and 3rd order effects caused by frequency dependent responses of subsurface materials. One example of a current full waveform system is the Titan 24 Deep Earth Imaging System of Quantec Geoscience (as of January 2007). An example of full waveform data gathered by MIDAAS Inc. in the early 1990’s is shown to the right. The figure shows the “off-time” IP signals for 12 potential measurements taken using one current station. “On-time” signals are not shown. 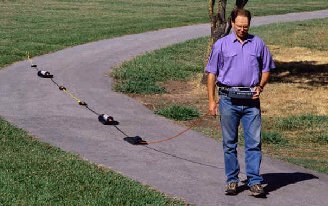 Corwin, R.F., 1990, The self-potential method for environmental and engineering applications, in Geotechnical and Environmental Geophysics, Vol I: Review and Tutorial, (Ward, S.H., ed), Society of Exploration Geophysics, pg 127 - 146.